The Noden Adjust-A-Bench is award-winning woodworker Geoffrey Noden’s response to his need - and yours - for a solid, stable work surface that changes height quickly and with ease. 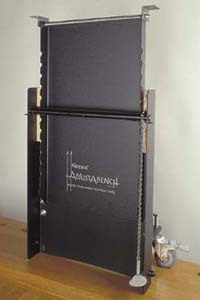 The heart of the Adjust-A-Bench lies in a pair of nesting frames (or trays), designed to retrofit with rails to a workman’s existing bench top. Made from 1/8" thick mild steel with a powder coated finish, the nesting frames stand 26.25", and add a range of adjustment of 16.5" to a bench’s height through their unique ratchet mechanism. The inner tray slides vertically thru 12 ratchet locking stops, guided by the outer tray, conveniently raising and lowering your work surface to meet the demands of your job. A convenient foot pedal releases the locking stops. The Noden Adjust-A-Bench will provide you with a comfortable, effective range of access to your work surface, increasing the overall efficiency of your existing workbench. 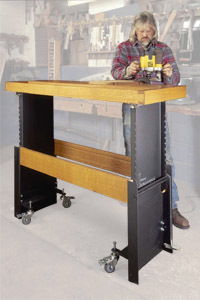 A Helping Hand - with Adjust-A-Bench, your work adjusts to the height of your tools. Working with heavy pieces - with Adjust-A-Bench, you lower your piece to allow involvement of more of your own body weight in the action at hand. Crafting fine details - with Adjust-A-Bench, raise the object closer to eye level where subtle hand motions can be more effectively guided. Sharing a bench with another woodworker - with Adjust-A-Bench, have the convenience of a surface that adjusts to varying heights, accommodating all craftsmen.